Is it possible that an iron fish that is made of recycled car parts and cooked in a pot could solve the iron deficiency issue? 6 years ago, when a Canadian science graduate visited Cambodia. His name was Christopher Charles. He discovered that the worst problem of Cambodian people was anaemia. In a village of Kandal province, children were weak and having slow mental progress. Dr Charles found that there was something wrong with those children. Not only children, women were also having extra tiredness and migraines. Those women were unable to complete their regular tasks. Moreover, pregnant women were facing lots of complications. Before and after childbirth, these women were facing haemorrhaging. The main reason behind this was iron deficiency. Anaemia is a very common issue that affect millions of pregnant women, teenagers and even adults. In different developing countries of the world, like Cambodia, this problem is spreading with a high rate. More than 50% of the children and women are the victim of iron deficiency. In general, if someone is anaemic, he should take iron pills or supplements. But, in Cambodian society, this solution is not working at all. There were three reasons behind this. There was a need to do something unusual. Dr Charles gave a great idea. He was familiar that when we cook in cast iron pots, the iron gets increased in the food. So he decided to put a huge part of iron in cooking pans that were made of melted metal. 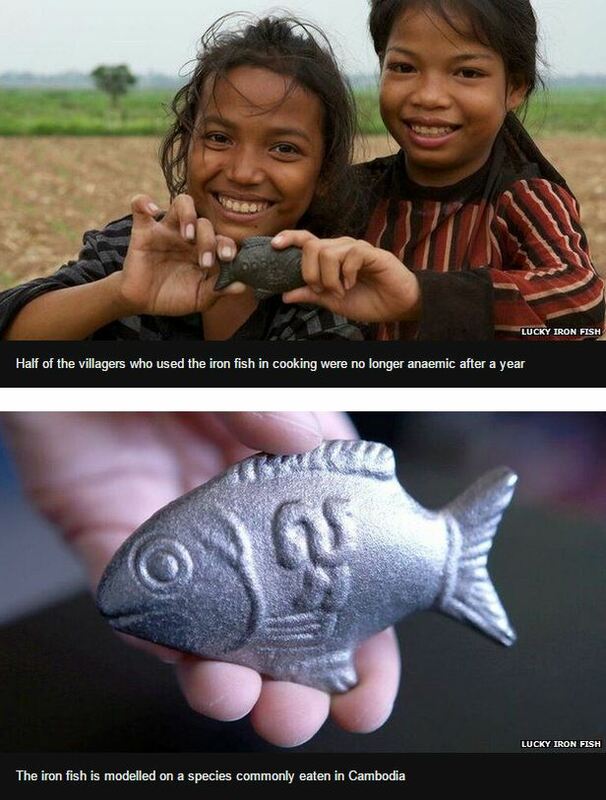 Dr Charles made a fish of iron. In Cambodian society, a fish is considered to be a symbol of good luck. He designed that fish in a very smart way that whenever put in the cooking pot, it releases iron accurate quantity. He explained the recipe of getting iron through cooking. So, this was the recipe. Dr. says, if you use this iron fish in a proper way, you could get enough iron of your daily recommended intake. 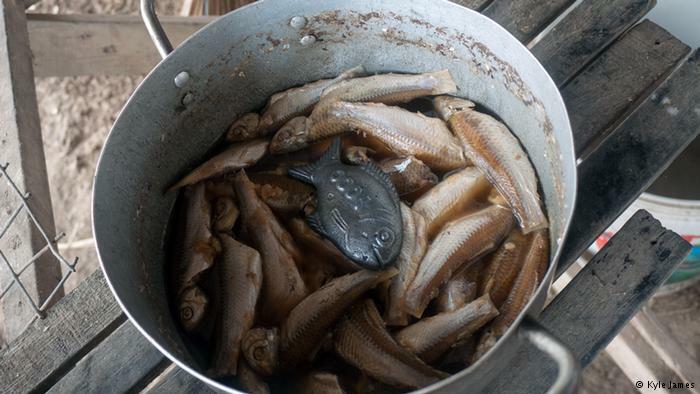 This experiment was done on hundreds of Cambodian villagers and it was showed that who used iron fish in the recommended way was no long anaemic after one year. So, it works more than a tablet or supplements. The head of the international Public Health Department, Professor Imelda Bates says that the iron fish is a healthy development. She added that these sorts of developments are much better than iron tablets that are horrifying. 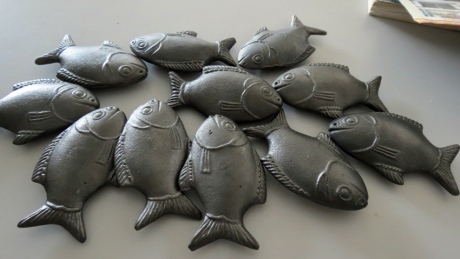 If iron fish increase the iron level in the human body, moreover if it is acceptable by the society and not costly, then it is a great benefit. 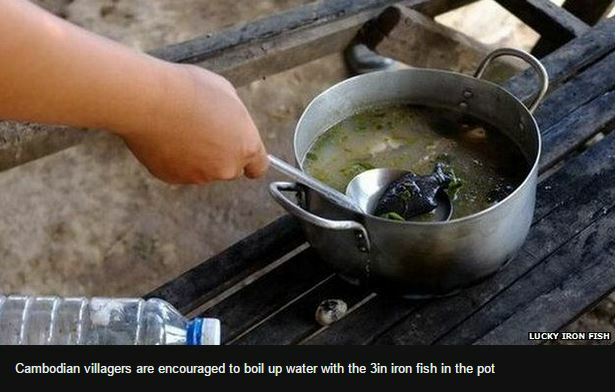 For now, almost 2500 Cambodian families are using the iron fish. 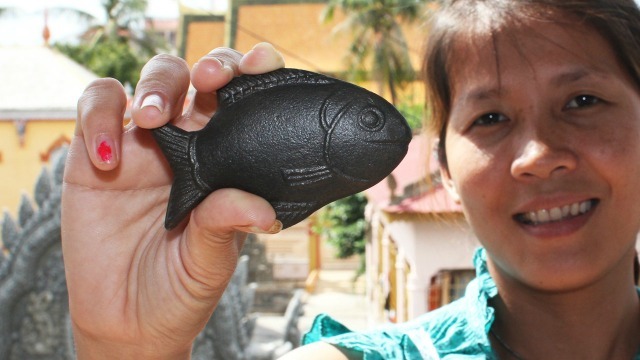 The Lucky Iron Fish Company has circulated 9000 iron fish in hospitals and private organisations all over the Cambodia. Dr Charles is happy because his invention is widely accepted by the most of the villagers. Cambodian people like the smiling fish that is 3 inch long and weighs 200 grams. One of the women and her daughter, who are the current trial participants told BBC that their blood test report have told that they are anaemic because of iron deficiency. They are going to use this iron fish and soon they will be healthy. The WHO has declared that over 30 percent of the whole world population is anaemic because of iron deficiency. At individual or country level, there is a need to stop this iron deficiency. If the rate of this iron deficiency reduced, we could restore individual’s health as well as we can increase productivity at national level by 20 percent. But there is one more thing you need to know. There are other forms of anaemia exist. This could be because of vitamin B12 and vitamin A deficiency. A parasitic infection like malaria may also be the reason behind it. Professor Bates says that anaemia gets more complicated if it not because of iron deficiency. She added that it is the end product of many health problems. It is no doubt a multi-factorial issue. In developing countries, getting an accurate blood test report is also an issue itself. Dr Charles says that the basic reason behind having an iron deficiency in Cambodia is the poor lifestyle or unhealthy poor food. He explained that Cambodian people have a very poor diet. They only take a small plate of rice sometimes with a small piece of fish. They take this meal twice a day. Of course, this doesn’t fulfil their nutritional requirements. They do not use iron-rich meals like red meat, green and leafy vegetables. Vegetables are not much rich in iron if they are over cooked. The Lucky Iron Fish Company has planned to spread the fish all over the world including America, Canada and Europe. But there is another question. Should everyone use this fish that is made of recycled car parts? The experts believe that there is no reason to use this fish as a daily routine, if you belong to a developed country. If you can get iron-rich fresh food easily, you should not use this fish. In developed countries, iron pills and the iron rich food is easily accessible for pregnant women and vegetarians. How iron deficiency affect your body? Iron deficiency leads to the reduction of red blood cells in the human body. In general, iron is the main source of red blood cells production. It also helps in storing and carrying oxygen in the blood. If red blood cells are reduced to the normal quantity, your tissues and other organs would not be able to get sufficient oxygen. As a result, you will get tired soon. You may also have a pale complexion and breathing issue with heart palpitations. If you do not cure it at the right time, you will become an easy prey for illness and infections. Anaemia is the reason for which 20 percent of pregnant women lose their lives. So pregnant women, newborn and children should also take care if they have iron deficiency.